As many of my loyal readers already know, my full time job is Executive Director and General Manager of one of Connecticut’s premiere television stations, BATV-Channel 5, 21 & 22. I truly admit, I am a child of the television age spending many an adventurous hour endlessly in front of an old black and white Zenith console watching the exploits of the Robinson family endlessly “Lost In Space”, as their faithful Robot incessantly warned “Danger Will Robinson”, or joining the mysterious Mr. Roarke and his miniature sidekick, Tattoo, (“The Plane Boss!, The Plane!) inviting lucky and luckless vacationers to fulfill their outmost dreams on “Fantasy Island”. But the one program that my family and I watched loyally every Saturday night was the ocean going series “The Love Boat”. We were all invited aboard each week to join our favorite sea-fairing crew including Captain Merrill Stubing (Gavin MacLeod,) Doctor Adam Bricker (Bernie Kopell), Purser Burl “Gopher” Smith (Fred Grandy), Bartender Isaac Washington (Ted Lange) and Cruise Director Julie McCoy (Lauren Tewes). Since that show first appeared on the horizon, we have all wanted to experience the thrill of an ocean-going cruise voyage. As “The Love Boat” lyrics so appropriately states, “Come aboard- We’re expecting you, set a course for adventure-. So join me now as your travel guide “comes aboard” the beautiful “Sun Princess” cruise ship to give you all the first hand info and details that this hotel on the open seas provides. My Sojourn begins as I fly out from our own Bradley International Airport, with a pre-night stay at the wonderful Sheraton Hotel at Bradley International Airport. The Sheraton has the most comfortable beds I have ever slept in and I always make it a point of staying overnight, fully rested, before any of my travel adventures. I journey now onward to the land of sunshine, Everglades and oranges, Fort Lauderdale, Florida, where I begin my cruise voyage aboard the stunning Sun Princess Luxury cruise ship. 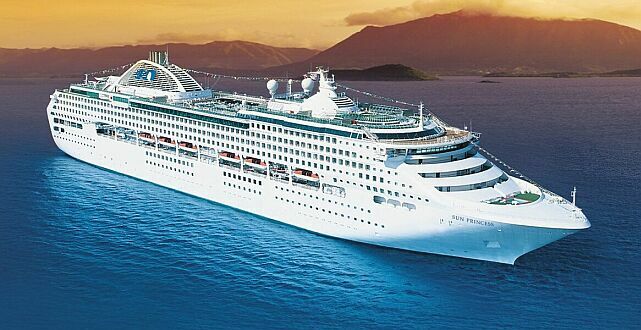 The Sun Princess, so awe inspiringly at first site, that one must stop, put down your overstuffed luggage and slowly take in her sheer beauty and the wonderment of her construction as we embark on a 10 day semi- stress free and hopefully calorie-free voyage. Starting off at Port Everglades in Fort Lauderdale, our Eastern Caribbean Islander cruise will take us to such exotic ports-of-call including: Nassau, St. Thomas, St. Maarten, St. Kitts, Barbados and Antigua. The Sun Princess, launched in 1995, rises 14 stories, has over 400 balcony staterooms, a wrap around Promenade Deck, weighs 77,000 gross tons and measure nearly three football fields in length This 1,,950-passsenger ship is one of the numerous ships of the Princess fleet, which includes such other “Sun-Class” ships including the Dawn and Sea Princess. For 2005, Princess Cruises, debuts a series of longer Caribbean adventures with a series of two 14-day itineraries aboard the Sea Princess, one of which will also include a new port of call for the line, the unspoiled island of Bonaire. In total, four ships, Caribbean Princess, Grand Princess, Star Princess and Golden Princess, will offer seven day itineraries, while the Sun Princess features alternating ten day itineraries and Sea Princess debuts the new 14-day itineraries. These are an incredible fleet of ships, and the Sun Princess, my home for the next ten days, truly is an amazing ship, with its full range of offerings, -continuous dining, and stupendous entertainment on the high seas as it whisks us away on a relaxing ( for me -that means no phone calls) fantasy-filled vacation. Once onboard, the first thing any passenger worth his weight in shrimp wants to do is eat. Be impressed, very impressed, for you can truly eat 24 hours a day to your heart’s desire and ever expanding waistline. Personal Choice Dining is a new option on Princess cruise ships, which gives you the freedom to dine when, where and with whom you wish. Traditional fixed seating is also available which allows you to dine at the same time every evening. I choose the new Personal Choice Dining, but the choosing does not stop there. There are so many choices to dining where do I begin; The Sun Princess has two main dining rooms, the "Regency" for traditional dining, and the "Marquis” dining room for anytime dining. Other favorite eateries on the Sun Princess include; Verdi's Pizzeria, the perfect place to enjoy a classic Italian meal of pizza, pasta and tiramisu; “The Sterling Steakhouse” which features special cuts of beef from the famous “Sterling Silver” brand, cooked to order; a Wine and Caviar bar and “La Patisserie for cappuccino, espresso and other coffee specialties. And of course the legendary 24-hour "Horizon Court" on the Lido Deck, which offers breakfast, lunch and dinner buffets. And there is still more including an ice-cream bar, afternoon high tea, hot sandwich and light snack buffet, and of course, burgers and hot dogs at the “Terrace Grill” and don’t forget room service –just call and more food is on the way. Now many of you may think after all this food, all you may want to do is sit around the pools or enjoy a whirlpool spa, but the Sun Princess is truly an adventure at sea, with each day’s activities fully described in the “Princess Patter” which is delivered to your cabin each night. On most days, I like to start my day with a leisurely walk around the “Promenade Deck” and then peruse the Patter for those activates that interest me. Such planned shipped activates may include: complimentary seminars at the “Lotus Spa”, various exercise classes such as Yoga, Pilates and body conditioning classes. Learning how to use your computer at the Sun Princess internet center, playing a round of golf at their Princess Links, playing morning and afternoon trivia for ship prizes with your fellow passengers, Ballroom Dance Class, wine tasting, watch a movie, art auctions, water volleyball, shuffleboard, real-live wooden horse racing or that ship time favorite-Bingo. Gee, I’m already tired, glad I am on vacation, or I might need a rest from all these activities. Other actives can be found at each port of call. As mentioned earlier, The Sun Princesses itinerary includes visits to six Caribbean Islands where adventure awaits. Typical adventures ashore may include: On St. Maartin: visiting a Butterfly Farm or taking a Mountain Bike Adventure or Lagoon Kayaking Adventure. On Antigua how about trying visiting the famous Nelson’s Dockyard and then enjoying a lobster lunch on Turner’s Beach. Barbados may have you visiting the “Graeme Hall Nature Sanctuary” or taking the “Jolly Roger Sailing Party” where you set sail with pirates and their rum punch on an authentic wooden schooner in the turquoise water of Barbados. Each Caribbean Island has its own unique locations and excursions, sometimes the best thing to do is just take a slow leisurely walk and find your own special sites that you will want to revisit the next time you come back to that favorite island of yours. During the evening you can enjoy such amenities including: the ships casinos where you can try your luck playing blackjack, poker, roulette or the slot machines. Go dancing or enjoy a late evening cordial at Sun Princesses night spots including: “Wheelhouse Bar”, “Shooting Stars”, and the “Rendez-Vous”. Nightly entertainment at sea is usually the highlight of each evening, with many a passenger heading toward the Sun Princess two show lounges, “The Princess Theater” or the “Vista Show” Lounge in anticipation of a live Broadway type review, or enjoying a musician, singer, ventriloquist or even the Cruise Directors Talent Show. On my recent cruise, Princess Cruises presented the following two lavish production shows: “Tribute” – a tribute to such singers and bands including: “The Beatles”, “The Beach Boys”, “The Rat Pack”- Frank, Dean and Sammy, and the Ladies of Pop, - Cher, Diana and Madonna. The “Curtain-Up” production features the music of George Gershwin and Andrew Lloyd Webber along with songs from some of the best loved Broadway musicals such as: Cabaret, Phantom of the Opera, Evita, Grease and Oklahoma. Both of these live shows at sea are upbeat, with spectacular sets, costumes and an energetic group of young entertainers. We only have one question though, “How are these “kids” able to stay on stage when the ship is rocking on those wayward days at sea? As stated, taking a cruise is indeed a true adventure, from boarding your massive cruise ship, enjoying the diverse selections of food and enjoying all the ship’s amenities. There is truly noting better than taking an ocean- going adventure on the high seas. The only sad part of a cruise, and I have heard this from those who have just returned from their first cruise to those old- cruise pros,– was knowing that the cruise was coming to an end and that they had probably had gained about five or more pounds. I hope you will all have the chance to experience taking a Caribbean cruise. And for those of you who follow my travel exploits, I will continue to report back to you on all my wonderful adventure on this small world of ours. Mr. Frydman has not received or accepted any type of compensation or gratuities in preparation for this article, nor is this article an endorsement or recommendation for any particular cruise line but a first hand account of his travel experiences. Howard Steven Frydman is General Manager and Executive Director of BATV – Channels 5, 21 & 22. I AM A CELEBRITY - not in the vein of Depp, Pitt or Cruise, but a Celebrity nonetheless! Now before you get the idea that I have a “swelled head” I actually write now of my most recent travel adventure on the ultra luxury cruise ship “Infinity” which is part of “Celebrity Cruise Lines.”It was during this period, 14 days at sea, where I personally had one of the grandest times afloat and thus became a “true” CELEBRITY.- In fact, according to the unabridged “Encyclopedia Howard Steven Frydtanica”- the term “Celebrity” is a term given to those who have ventured forth on sea, be it on their first or 101stth cruise on a Celebrity Cruise Ship, -well known for their signature "X" Celebrity ship funnels, which is the Greek letter chi, for "Chandris" the family name of the original founders of the shipping line-, and who have been transformed by their experience on board from the ordinary to the ultra extraordinary. Simply put-Celebrity cruises transformed me into a lover of all things Celebrity- thus I AM A CELEBRITY. Here’s why!